So I bring you something on my design wall that has been there before. Usually my design wall is just a place to store completed (or half completed) blocks. Today is no exception. First I have some more Journey Steps blocks on my wall. I am hoping that I can get these integrated with the rest soon. But I think I still need more. I found out that the website from the pattern is defunct. I would have liked to link back to it eventually. And no, I’m not going to post the pdf here, but I can always explain how I made this block if you wanna know. think 4 patch inside 4 patch inside 4 patch. I also received a nice set of light strips from Victoria at PeacebrookQuilting. She completely deserves a great big shout out! Can’t wait to put these into a few more blocks! And next, I was fooling around with some of the left over triangles from my card trick quilt, and decided to make a few blocks for the back – because that’s now my signature style. 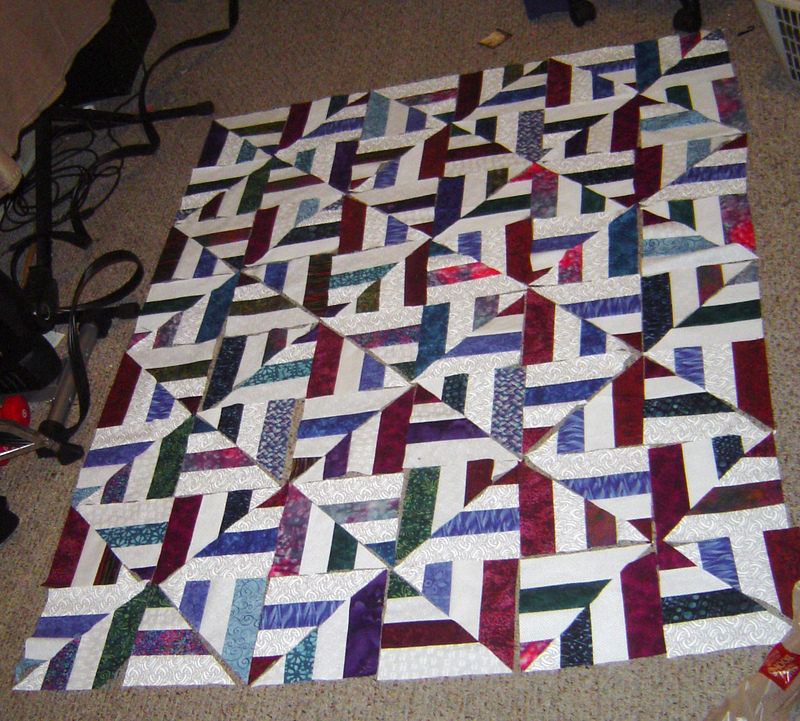 I know I could put these on the front, but I only have enough for these three blocks – my burgundy is gone after this. AND, I am not buying any more of the background fabric for this. I was just messing around with the little hourglass blocks & put 4 together, and another 4 together. Made me feel ‘designerish’ even though I made a design that’s been done before. Really felt through the process of the design, ya know? The block on the bottom I purposefully finished as a broken dishes block rather than a pinwheel. And a few days left before starting the 5 inch fabric swap. 5 inch squares, how cute! 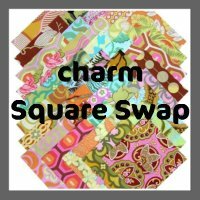 You thought I forgot about the Charm Square Swap after I chanted it a few podcasts ago, didn’t you? We have 10 people, with now 5 people watching the swap. You need to sign up soon (Sept 2nd) if you want to play along, but you don’t even have to send the fabrics until Sept 30th. So if you have time to get them ready now, get the blocks ready now. If you’ll have time later September, do it then. 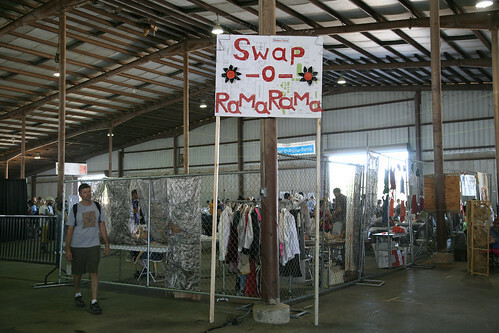 You have to be a member of the Quiltcast Supergroup Swappers group, and a member of swap-bot first, but once you are, you can be in all the other swaps we will do! Here’s the link to the swap. 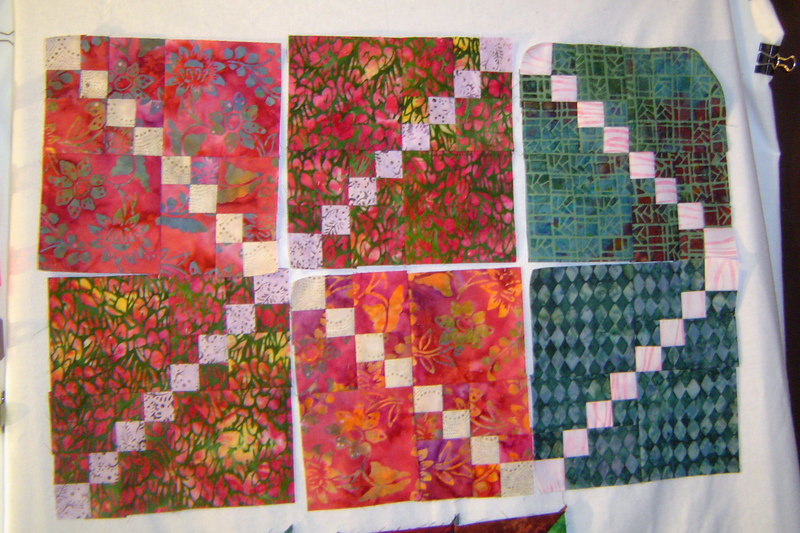 Also considering doing a color – coordinated sampler quilt swap spanning over several months. This swap would be the blocks that YOU choose that square up to a specific size, with colors that I choose (for everyone), and size that I choose (for everyone). Post a comment here if you’d like to encourage me into organizing it and right now thinking Jan 2012 to start. 4-6 swaps later, you would get a nice sampler and would have something that would push you do blocks that YOU desire to try. Lately, I’ve been concentrating on swapping. There are many online swapping tools to help facilitate swapping, it’s like having a pen pal that sends you stuff! You can search flickr for swap groups. You can go to craftster to swap. The two groups I’m going to talk about are Swap-bot.com swaps, specifically the Quiltcast Supergroup swap group (which you are welcome to join the group and potentially join the swaps), and the Yahoo Group Sew Many Swaps. 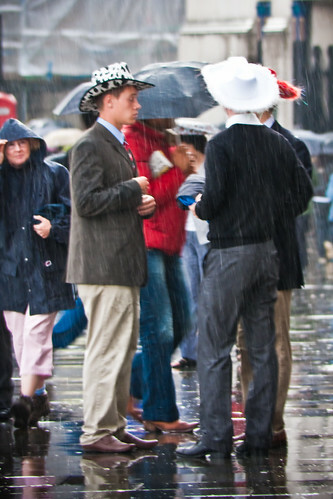 Swaps are organized “person-to-person’ a.k.a. decentralized swaps, or they can be centralized. Swaps are cool. 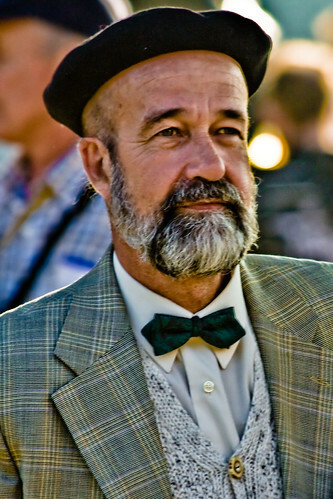 Like stetsons and bow ties! 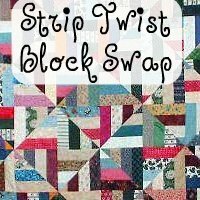 I am very excited to share with you the first set of blocks I received for the strip twist block swap. I love the variation in these blocks, and yet, there is enough similarity to tie the blocks all in together. Very bright and bold, very exciting! My favorite fabric in this is the yellow diamond, but I also love the blue stripe, and one of the reds has little diamonds in it! Very cool. All the fabrics are cool, and, best part, none are fabrics I currently have. Now I can’t wait to see what else I get! How much fun is this! 12.0 Time for a New Swap! A new swap has started! Thanks to Katie of (QuiltedMagnolia fame) Katie’s Quilting Corner for organizing the swap for members of the Quiltcast Supergroup on Big Tent. Today was the first day of the swap and so time to find out from the partners what fabric choices they like. I’m excited to get started. Looks like both my partners like batiks. And another swap I am going to do for Sew Many Swaps is also wanting batiks, and so, it looks like I have a good direction to go when I enter the quilt shop next time. I am glad I messed up worked on my strip twist blocks before now on my butterfly project, so I got all my mistakes out of the way. Very good thing. I’d love to stay and chat, but I really, really need to nap so I can make it to Quilt Guild meeting tonight. And tomorrow is our night (afternoon) out, so see ya in a few days. I want to thank Sandi from Quilt Cabana Corner for providing my blocks in the Quiltcast Supergroup Tilted Four Patch block swap. She provided me with the nicest purple tilted blocks. I was thinking … this should make an easy and quick quilt. The blocks have a light, dark and medium purple, all based in the red-purple family. It was a fabric I found in the bargain bin, but has both the red purple and the blue purple in flecks. So I am putting in corner stones of blue purple. And working on them quilt as you go! The first quilt-as-you-go project of mine. I made the back the same size as the blocks, figuring I am adding this wide sashing to each side. The batting sticks out an inch on each side because my finished sashing is two inches wide. 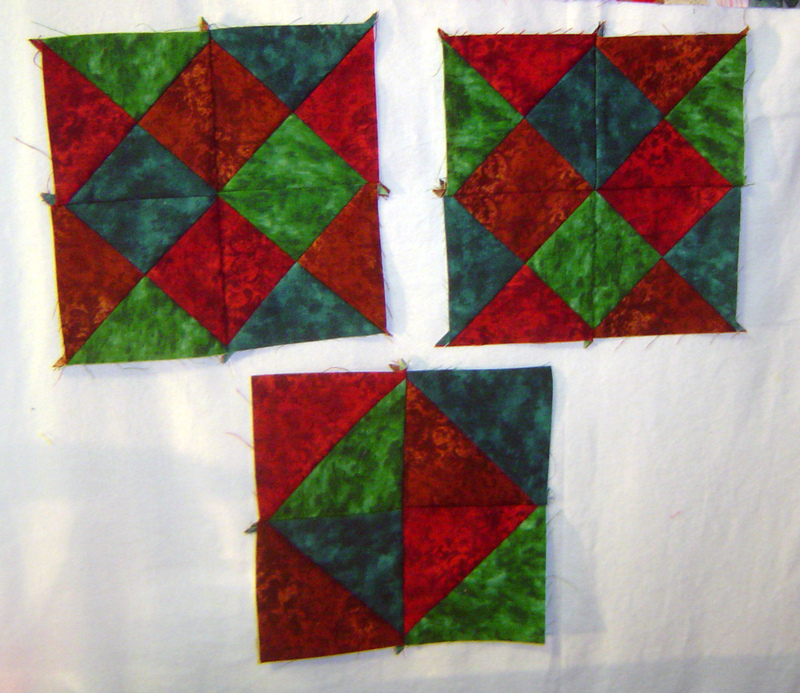 Yesterday I took my ‘New Year’s Eve holiday’ to quilt the blocks. First Free Motion Quilting in a while. This gave me practice on the design that is going on the hurricane quilt. My corners got a free motion round stipple effect, which was much more fun, but much easier to start to speed up at the end. Now the method of joining these were slightly different than Allison’s (of Within a Quarter Inch) method of joining the blocks. This being that the sashing still hasn’t been joined before quilting as you go. 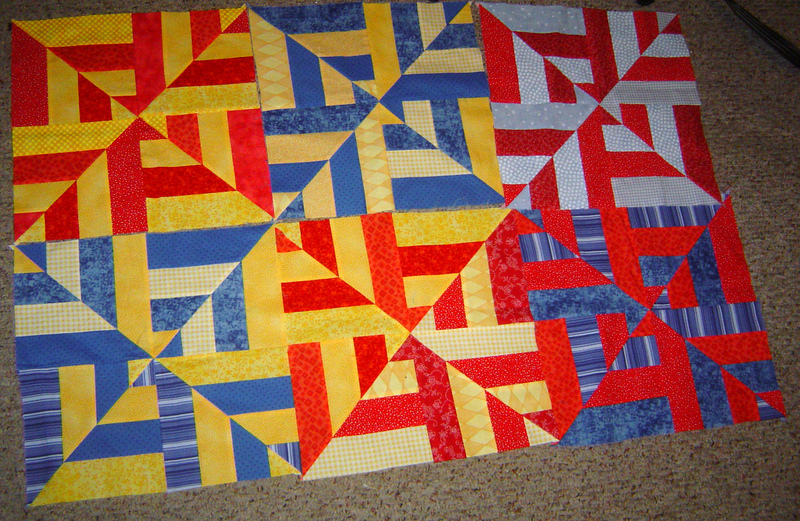 The rest of the post is a tutorial on how I handled the wider sashing as quilt as you go. The front side. 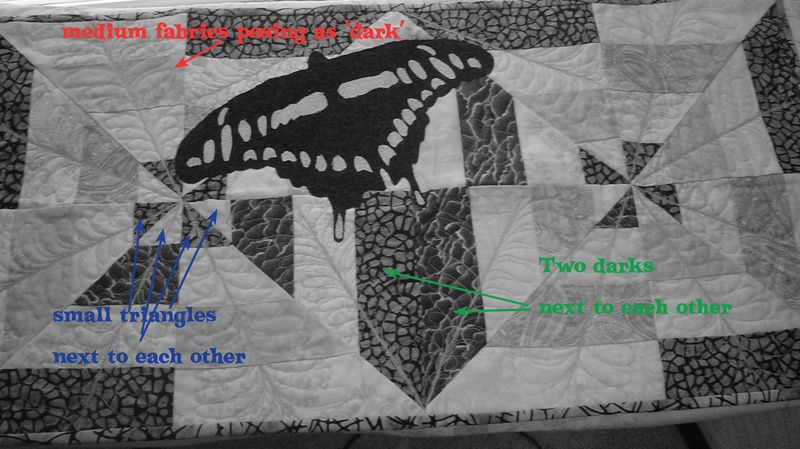 The back side of this quilt , I haven’t completed yet, so no pictures, but I KNOW how I want to finish it. I am leaving the 1 inch of batting around each edge so the sashing can have some batting. Sashing for this quilt is 2 and a half unfinished, 2 inches finished. 1 inch of batting from one block plus 1 inch of batting from second block should fill the 2 inch gap nicely. If you have wider sashing, leave more batting around each block. So I start with sewing the sashing on 1 side of the block. DO NOT cut batting down to the edge if you want there to be batting under your sashing. 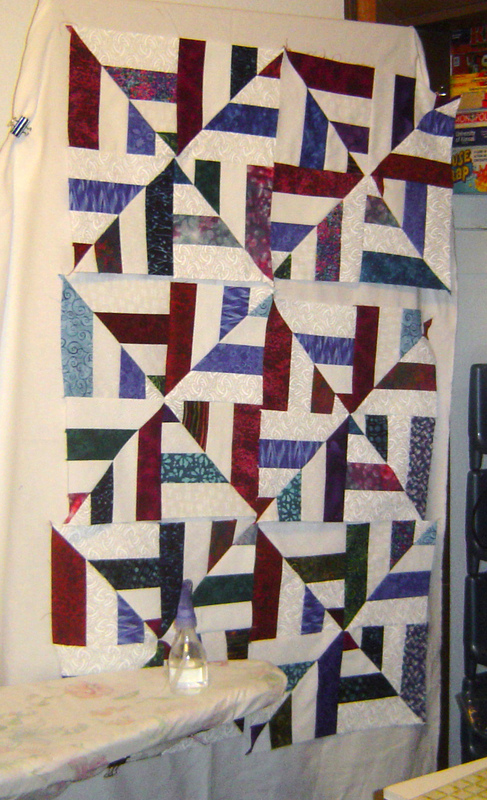 Now to join the other completely quilted quilt block. Open the sashing. Flip this piece upside down. 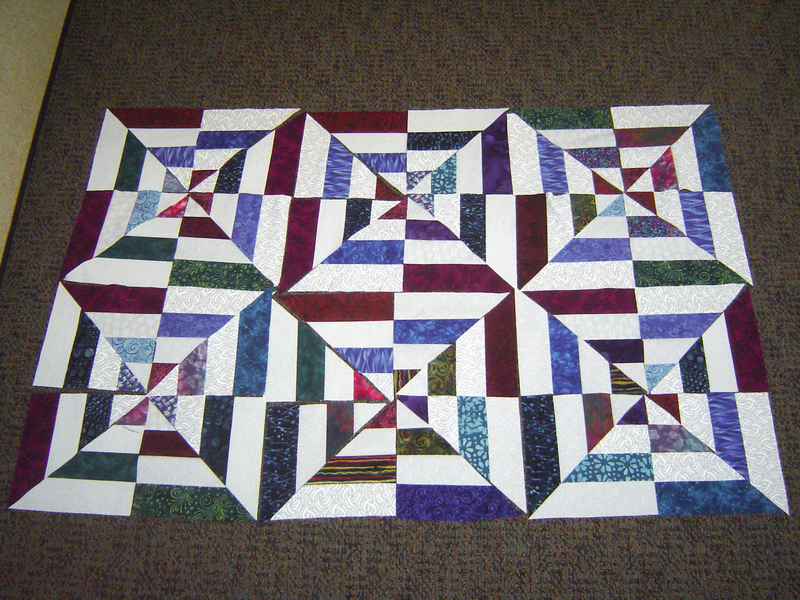 Put the other quilt block on the bottom and line up the raw sashing edge with the new quilt block edge. Sew it, and open. Press. DO NOT cut batting down to the edge if you want there to be batting under your sashing. If you have over lap, go ahead and trim pu the batting so that it lays flat and butts up together. Here is the front (actually picture taken before I pressed). Sew the next sashing to the corner-stone (if you have one), pin it to one side of the double block. Sew. Be careful. Even with a walking foot, I found the bottom more tightly sewn than the top. The single piece of fabric on the top always seemed to have a harder time easing into the seam. So I had to hide the extra seam fabric in the corner-stone. This was lining up before I started sewing, but by the middle, my bottom fabric sandwich was much farther along in the machine than my top fabric. Pins helped, but did not prevent this. Has to do with either my walking foot, or the extra layers, or both. I have suspected similar type problems with my walking foot when working on the bag, but perhaps this is natural? We’ll repeat the process of flipping this set of 2 blocks over, and sewing the raw edge seam onto another group of two blocks (also pinned – pins not shown below). At this time, I have the quilt as you go done on this point. I am working on the outside sashing and cornerstones. I also have to quilt as you go my border fabric, which is just adorable. Or adorabibble as my friend says (she bought the same fabric on the same trip, unbeknownst to me). First I have to go cut more batting down to size. I do have the borders size predetermined, and the outer sashing and corner stones will provide me a way to connect the inner quilt with the borders. To complete the back, I have sashing that is the same size (no corner stones) and I am going to fold over a quarter inch on each edge and top stitch it onto the quilt. Like an extra wide bias tape. However, I MAY have to make the sashing just about a quarter – half inch wider just to handle some variations in my fold as I am going along. But I suspect the current sashing is going to be adequate. I should be able to update in a couple of days once I make sure I have figured out all the kinks in doing borders on quilt as you go. If so, consider this post a ‘part 1’ as it were. … to the “quick and easy quilt” thought I had earlier … DOH! This coulda been much quicker and easier if I wasn’t trying out a new technique. But look what I have had a chance to share with you?! So no loss there. Happy New year everyone, let’s keep experimenting!